The Missing Ingredient – It’s Small But Makes a BIG Difference in The Results. Ever made a batch of cookies? My kids and I do often. 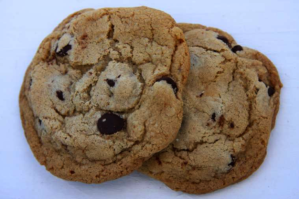 We love the wonderful taste and flavor of a properly baked chocolate chip cookie – who doesn’t? Fresh ingredients are important but also the right ratio of those ingredients matter too. Flour, sugar, eggs, butter, etc. mixed together make a sweet and tasty batter, but the batter is only half of making a great cookie. Baking, at the right temperature and length is what makes a cookie amazing, sugars get caramelized, chocolate starts melting and the cookie gets the beautiful shape and size. Did you know the smallest ingredient you add to your batter has the biggest impact on the outcome of your baked cookies? Just a teaspoon of this ingredient insures you get beautiful, plump and moist cookies, fail to add it and you’ll get flat, fragile and challenging to eat and handle cookies. It’s a leavening agent – know what that is? – that puffs the cookie batter up when it’s being baked. It’s what gives the cookies size, shape and softness. Simply put it’s baking soda. 1 teaspoon or 1/350ths of your total recipe is a game changer in terms of the outcome of the final product. We feel a lot of organizations attempting to do commerce online have all the big ingredients for success (a website, traffic strategies, content strategies, budget, execution tools, analytics, etc. ), yet, they are missing the small important ingredients that can be the game changer for their outcome. The small ingredient is clear and actionable insights about their customers and how those customers shop for their products. You can have the best site on the planet, the most sophisticated tracking but if you don’t learn, understand and take action on how customers shop for your products, you will have no way to better understand customers needs and how to address them. Listen, people commonly shop first, then buy later. Shopping is an important act, because it focuses on the customer collecting information. They learn, get educated, entertained and begin the process of feeling comfortable with the decision of buying and parting with money. We’ve discovered the shopping process can take anywhere from 3 days to 8-9 days if not longer. It depends on the product, the experience and the customer. Commonly when people are in “shopping mode” they visit your site or product page on average 4-5 times before they buy, but the site they visit from has an impact on how many times they will frequent your page while they are in shopping mode. What Ingredient Should I Add and When Should I Add It? Do you know what information you need to provide them with the 1st time they visit your site vs. the 4th or 5th time? Almost all organizations don’t have a strong grasp on this. Sure they have their “marketing funnels” but what they don’t have is an understanding how customers get educated, shop and make decisions and modify the approach to customer centric vs. marketing funnel and/or product centric. One of our clients had a very very strong belief social had a huge impact on shopping, in other words it drove the first 1-2 visits to the site. The data showed the opposite. Social media only had a strong impact on the 4th and 5th visit to the site – people were getting product education elsewhere. In other words, when it came to social, our client’s customer was done “shopping” and was “ready to buy.” The customer insights we provided were unique to the shopping experience the client created and the data was strong enough that it convinced them to change their tactics on social to more “what else can we help you with?” Like that, this little ingredient, changed a flat tasteless cookie, into a beautiful soft and tasty one – all because they added a small amount of the most important ingredient – customer insights. The behaviors of their shopping customers shaped what the client should do, and improved their outcome - their sales jumped. So the next time you get ready to make a new product, or even launch a new campaign remember to include customer insights as part of your ingredients. 1 teaspoon is all it takes to make a huge effect on a tasty outcome. We’re here to help and hear from you. Email or Engage. If you are interested in a career as a customer engagement manager, data analyst, programmer, account manager or sales/business development please contact us.